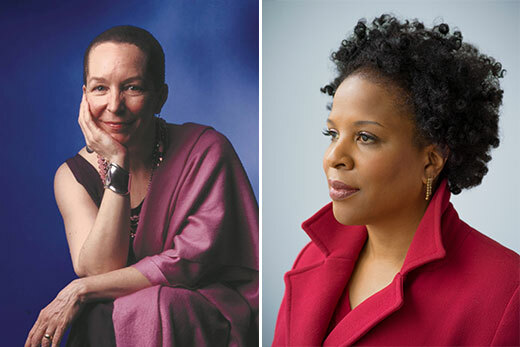 Pearl Cleage (left) and Tayari Jones (right, by Nina Subin) will discuss mentorship and writing at 7 p.m. Thursday, Sept. 27 in the Cox Hall Ballroom. There are no seats remaining as of Sept. 18, and registration is now closed. New York Times best-selling author Tayari Jones joins Pearl Cleage, the nationally recognized playwright, poet, novelist, and social activist, to discuss mentorship and writing on Thursday, Sept. 27, at 7 p.m. in the Cox Hall Ballroom. Books will be for sale at the event, and a book signing will follow. Doors will open at 6:15 p.m., and guests must be seated by 7 p.m. The event is open to the public at no charge, but registration is required for this event. Jones, who becomes an Emory creative writing faculty member this fall, is a graduate of Spelman College, where a class taught by Cleage fostered a passion for writing that set the course for her career. Jones’ “An American Marriage” and Cleage’s "What Looks Like Crazy on an Ordinary Day" (also a New York Times best-seller) were both Oprah Book Club selections. Cleage, whose papers are housed at the Rose Library, has written 18 books and plays; several of the plays have been staged in theaters around the country.